So, the picture of the 'Trail Fly' in the previous post was taken over a week ago, and I only just recently got around to posting it. Since the new game (aka Project 2) has gone through a style overhaul. All the art is getting redone, and since the 'Trail Fly' was just redone today, I thought I'd post it. I posed him in a similar way so it's easier to compare and contrast. Enjoy! Hmmm.. just looking at them now, I do like the red eyes better on the old one. I'll have to see about bringing that across in the new one. Thanks Nathan! Oh, you're welcome, Nathan. So happy to help. Is it bed time, yet? Yes, I think it is. "Mysterious Project 2" is coming along nicely. I plan to be able to share more information about it soon, but i thought it'd be nice to show something from it. 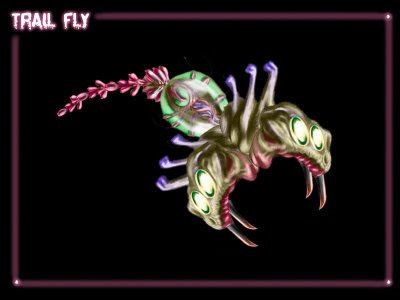 Creatures encountered in the new game are alien in nature (surprise!) and given simple, descriptive names by the character team as they find them. This is known simply as a 'Trail Fly'. 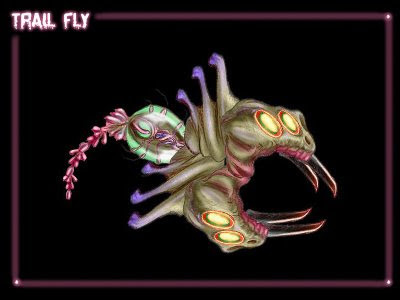 It mostly flies around minding its own business until you bump into him, or attack him. Then he tends to get all bent out of shape about it, and won't stop dogging you until... well, until he you're in small enough pieces which he can digest. But wait, what's this about a "character team"? Find out soon! Prepare thine eyeballs for fancy data picture overload! I've shuffled and jumbled the Weapon of Choice numbers from sales, free downloads, countries, dates, and put them all together in pretty picture form. Up first is one of the most informative graphs. 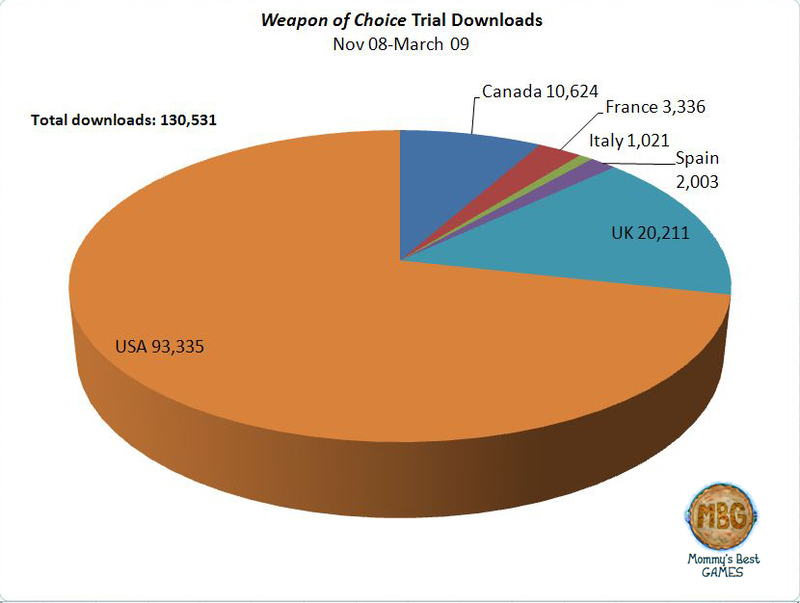 This shows free downloads and sales along with important dates of media coverage. 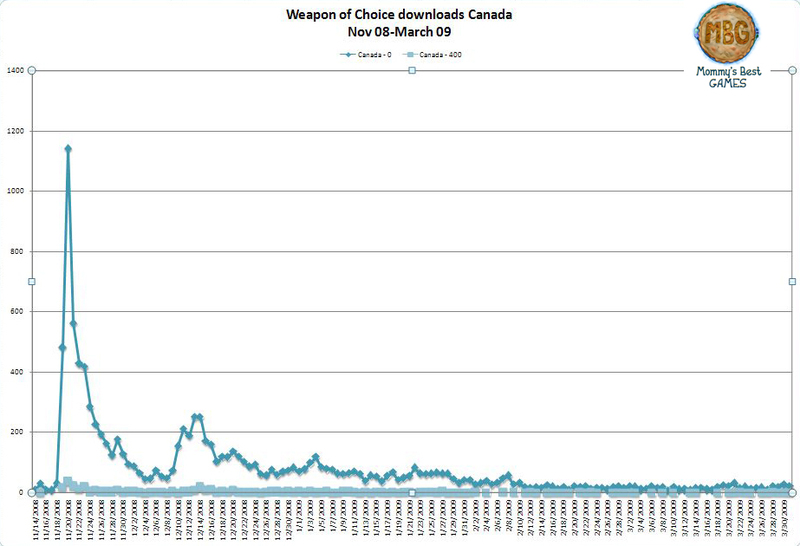 It's pretty obvious that when we got media coverage, we got a bump in downloads. The biggest spike was of course around the Community Games launch day. 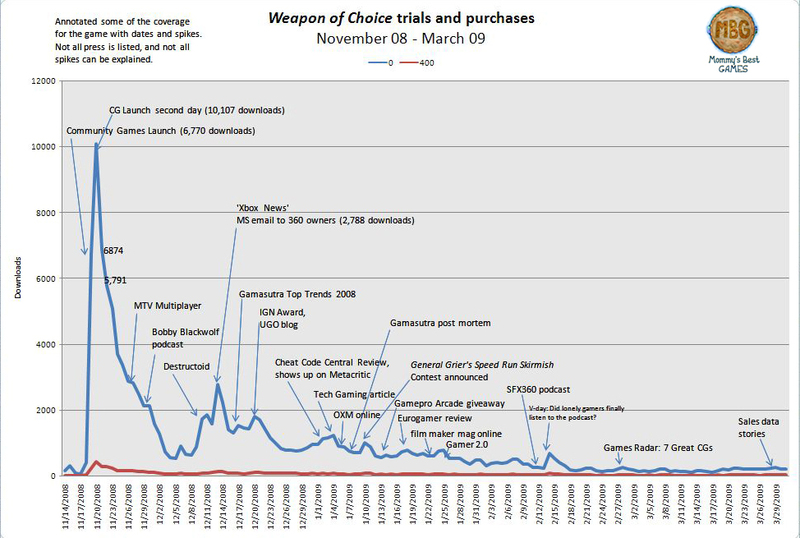 The largest other spike was when Microsoft sent out their weekly email to Xbox 360 owners, and this one included a small part about Community Games and Weapon of Choice. It was also really nice to see a spike in January 2009 related to the announcement of our speed run contest. The following is the same data, but with the logarithmic view to better see some of the action in early 2009. This next group is interesting as you can see trials and sales by country. 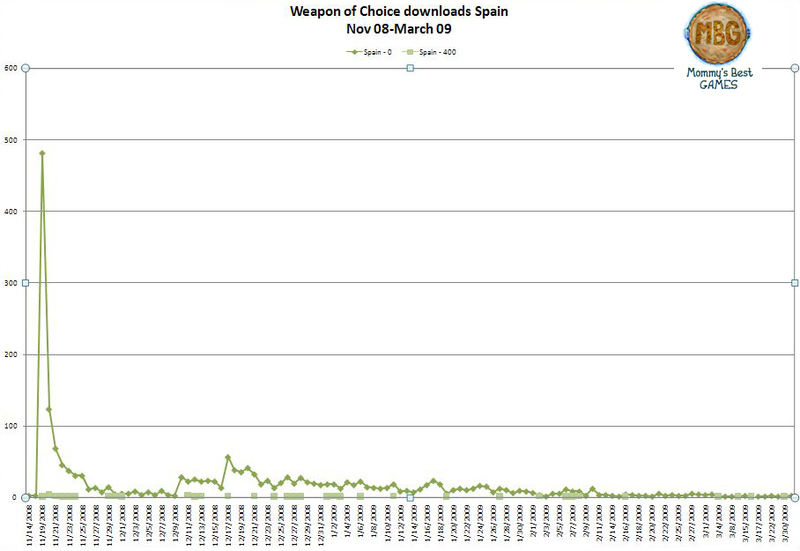 Keep an eye on the number value for first giant spike, per country. 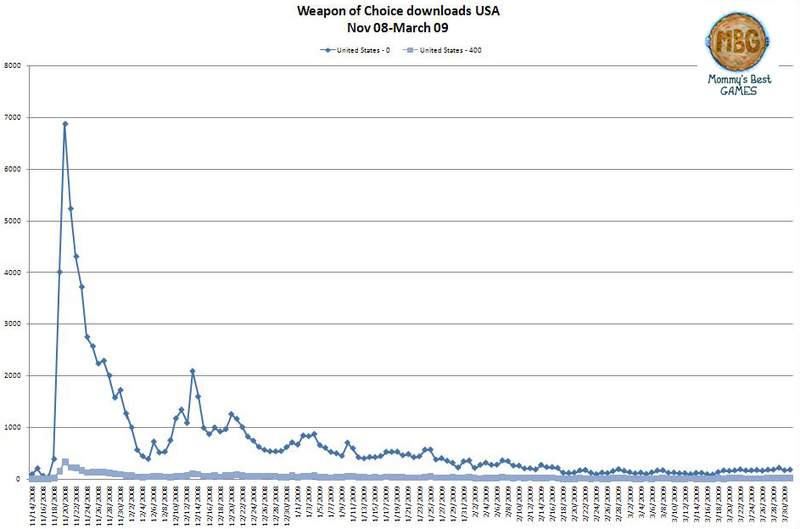 I think the USA vs UK comparison is interesting when you consider the first and second large spikes on the left. Here we see that the second 'Xbox News' spike is not only larger absolutely, but also proportionately. The UK "Xbox News-to-CG Launch" spike ratio is about: 380 to 1,750. The second spike here is about 20% of the first spike. 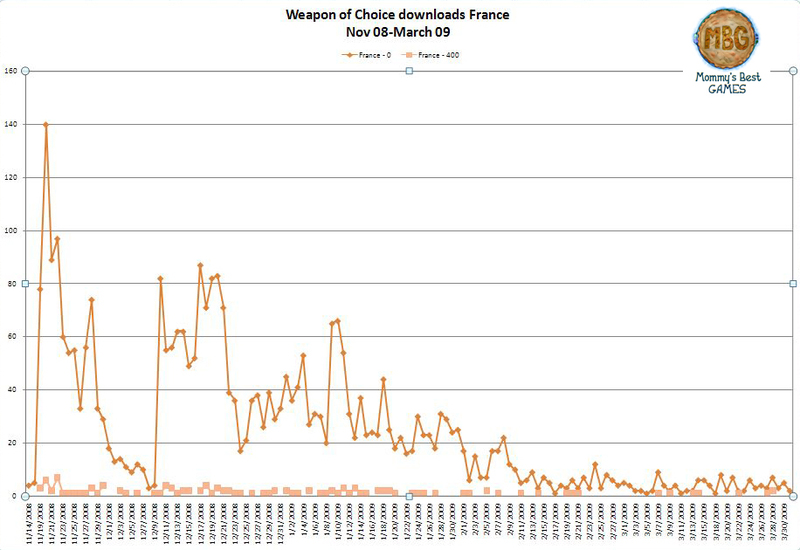 Also, there was also apparently some UK coverage of which I have no good record (not surprising) as around Valentines day, there was a much bigger increase in downloads there, than in the US. On to the rest of the WORLD! I'd like to close with a delicious slice of pie. American pie. All-American Apple pie. Or "Triple A" pie for short. But then again the UK slice is pretty tasty too. What do they eat in their pies again? Cow brains? Sheep guts? Whatever it is, it tastes pretty good here. And let's not forget Canada! 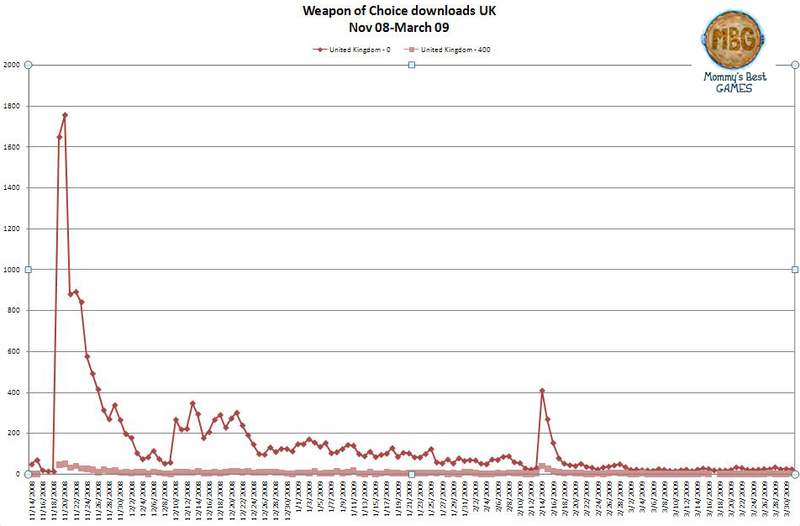 That was over half of our UK downloads, which is pretty impressive considering most Americans don't even know they're 'up' there. I like to think of their slice as covered in maple-syrup as I'm pretty sure they can't grow any sort of fruit there. Or maybe Ice? Can you have ice pie? By request I put together another pie which yielded some interesting results. 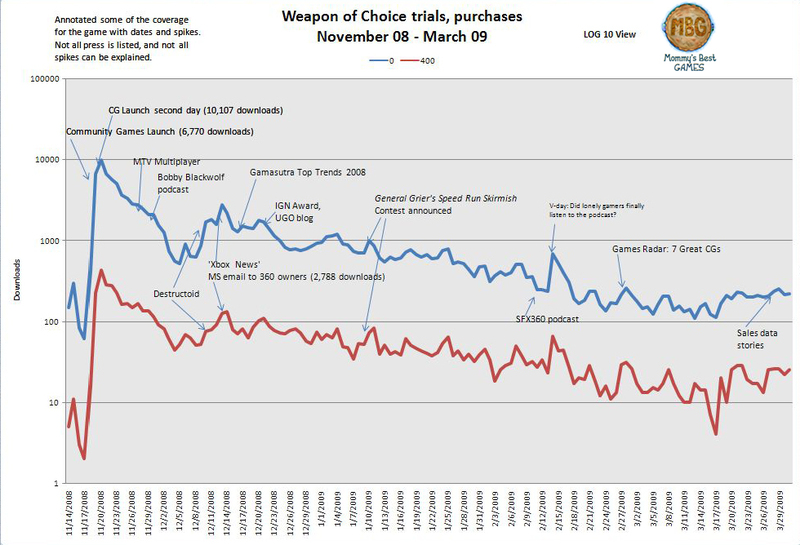 This shows approximate percentage sales and conversion rates (ratio of people that bought the game to people that downloaded the game). 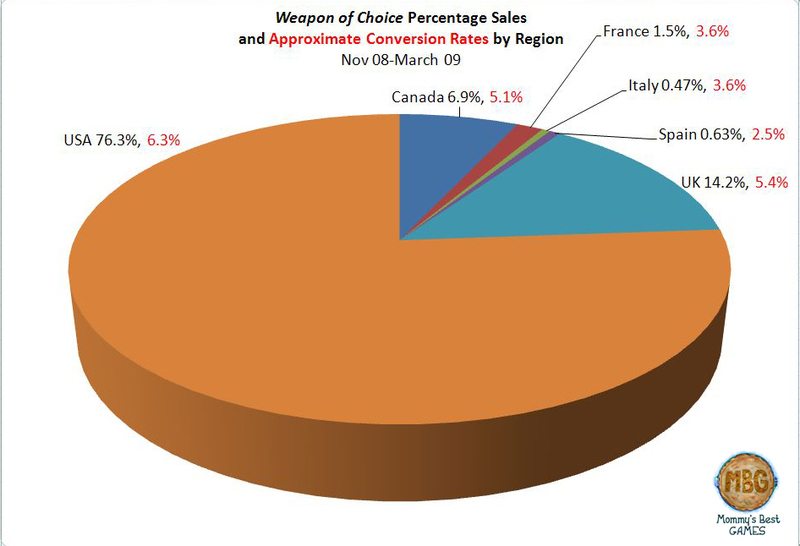 What's interesting here is the noticeably lower conversion rates in France, Italy, and Spain. This could be the result of several factors such as differing cultural interests, but it could also be because the game was only available in English which turned off more gamers. While there's not a lot of story in Weapon of Choice, there is certainly some dialog (over 200 lines!) and not being able to enjoy the story, the menus, and the controls could have contributed to less purchases. In conclusion, I know it sounds obvious that getting media coverage should increase downloads, but occasionally you get people questioning the idea. 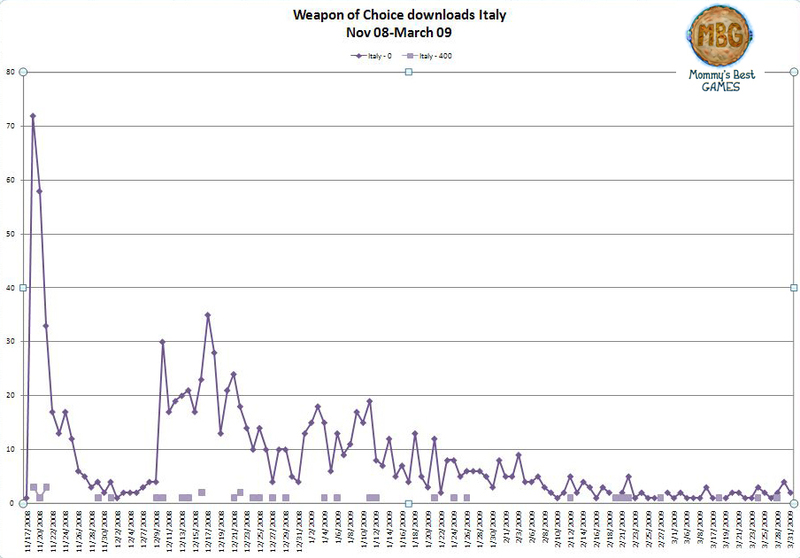 I find it comforting, like feeling terra firma beneath my feet, to see coverage pretty clearly linked with downloads, here with the real data.